Miss Berry thanks Mrs. Haines for her gift and tells her how much it means to Berry. She asks Mrs. Haines to tell her friends about the work she's doing. She says she's never visited Mr. Fulgham's school, but she'd like to be able to visit all the former Berry students and what they're doing in their communities. 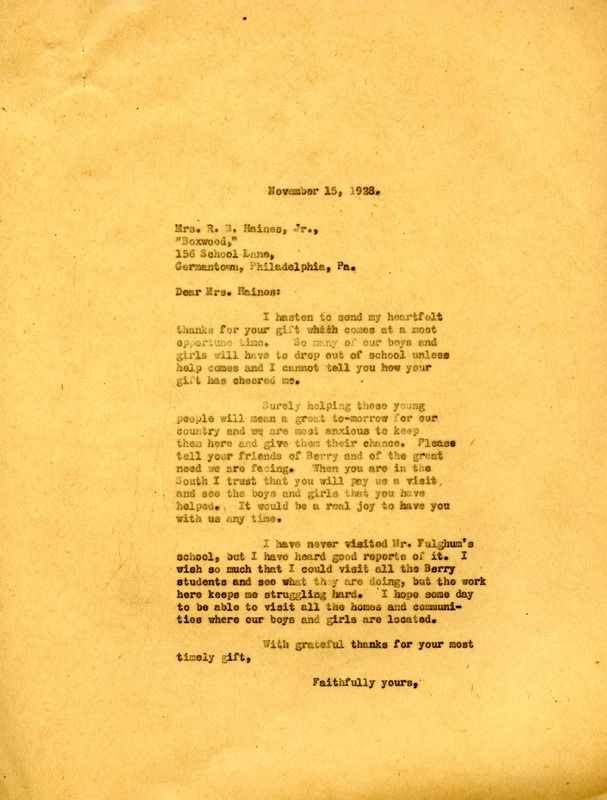 Mrs. R. B. Haines Jr.
Martha Berry, “Letter to Mrs. R. B. Haines, Jr. from Martha Berry.” Martha Berry Digital Archive. Eds. Schlitz, Stephanie A., Chelsea Risley, et al. Mount Berry: Berry College, 2012. accessed April 25, 2019, https://mbda.berry.edu/items/show/7677.